Vinyl fences are some of the most durable, flexible, and customizable fencing options on the market today. 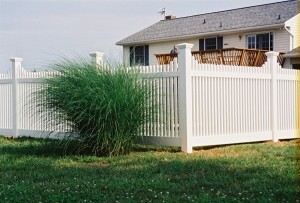 Vinyl fences are some of the most durable, flexible, and customizable fencing options on the market today. If you are looking for a new residential fence or commercial fence for your property and weighing the strengths of each type of material, here is what you should know about vinyl fences. Vinyl fences are incredibly low-maintenance, especially when contrasted with other types of fencing materials like wood or iron. Maintaining your vinyl fence will be as easy as gently washing it with a mild soap and rinsing it off with water. You will never need to worry about painting, staining, or sealing your vinyl fence, as the material requires no additional help to be water-resistant and rot-resistant. Vinyl fences do not deteriorate when they are exposed to the elements and you will never need to worry about any insect infestations or rot making your investment worthless. Vinyl fences aren’t just aesthetically pleasing, they are also pleasing to your wallet! Vinyl fences are known for lasting longer than many homeowners actually live in their homes, so you don’t need to worry about replacing the entire length of your fence again in 10-20 years. Vinyl fences can be a little bit more money up-front, but that money is more than returned in the long run when they have survived for decades without any problem. If you are looking for the most bang for your buck, vinyl fences are your best bet. Vinyl fences are known for being some of the strongest available on the market. Vinyl fences can easily withstand heat, snow, and rain without any issue. Over time, vinyl fences can take a beating and still keep your yard looking great. If you need maximum performance from your fence, the best possible option is vinyl fencing..